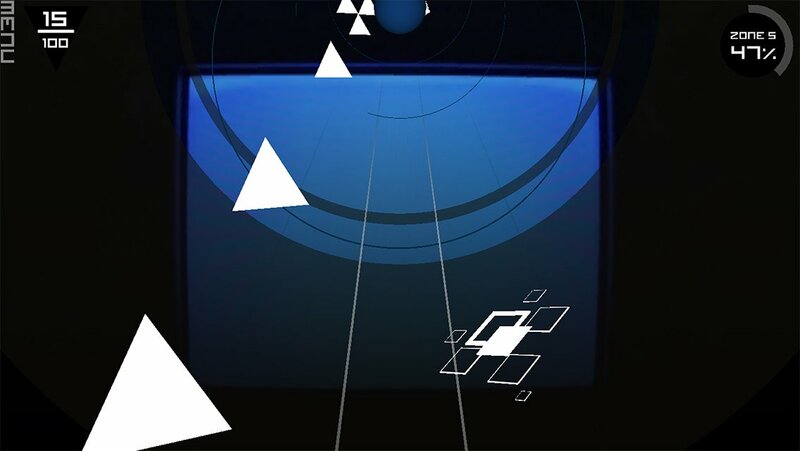 Cosmophony ($2.99) is a rhythm-based tunnel shooter that is built to be challenging, with formations of obstacles to avoid throughout five levels, all set to an EDM soundtrack. The rhythm part is loose at best, but changes in the game do go along with changing sound cues. The problem is that the game is built around its challenge being through perfectionism. That, the only way to advance is by completing a very hard level in one life leaves a bad taste in my mouth, and limits what this game can do. I am not opposed to perfectionism as a challenge for players, as a measured way of succeeding. That should be an option and that is perfectly fine. What I am opposed to is perfectionism as progression, which is what Cosmophony does. If its practice mode–which allows for players to start from each level’s segment and has star rewards for completion and for destroying all targets in the level–was the way that players progressed, that would be fine. Instead, it’s the perfectionist normal mode that drives progression, requiring that players beat levels front to back in one shot. This is a tall, tall, tall task that it’s asking players to do. And frankly, it doesn’t take long for the game to stop being fun to play, and to encourage trying to beat it out of spite. This should not be the default mode of a game. And with the star system, it would be possible to create a progression where players would need to replay earlier levels with an eye on getting all enemies or beating levels in one run in order to progress, but spread out over time. But something needs to be done – there should be the option to enjoy the game and not just be frustrated by it, hitting a brick wall of progression. I like challenge, I like challenging games, and this game at its best is exhilarating, and it sometimes is because of that perfectionism. Knowing you’re making your way through a tricky section, that you’re almost at the end, gets your heart racing. There is a benefit to that high barrier to completion, I just think the drawbacks are greater. The controls wind up being an issue too, at least on the iPad. Moving is done by tapping virtual buttons on either side of the screen, with a fire button in the center. On a phone, this would make sense, stretching one’s thumb to reach that fire button wouldn’t be too uncomfortable. But even on the iPad mini, it winds up being a challenge to reliably hit. And since this game is so perfectionist, having an additional barrier to do well is too much. This is a problem that can be solved by moving shoot buttons to above the movement buttons on the bottom, I believe. Hope the developers give it a shot. The game does support MFi gamepads, which is always a welcome addition, but I think for a game like this, it’s suboptimal. 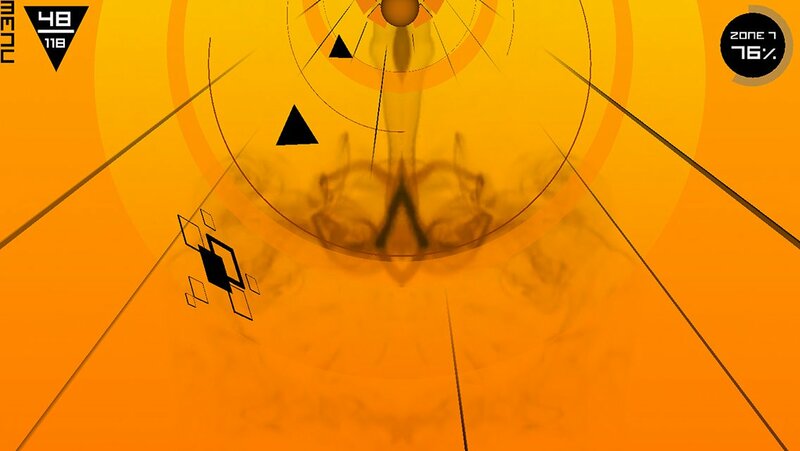 See, in a game like this and Super Hexagon ($2.99) where left-right movement are the primary operations, touchscreens shine because each side of the screen can act as two giant nebulous buttons, one for each thumb. And it’s a more intimate experience to actually be touching the game, I think. I think it’s, to some degree, a better way to play the game. Not the best way: the Donkey Konga bongos are the best way. But I can’t use them on iOS, now can I? Thanks Apple. Cosmophony will likely satisfy the masochistic, the people who get their jollies from perfectionist games, and this one throws everything it’s got at the player. Does this kind of challenge sound like fun? Then pick this up. Otherwise, you’ll probably want to steer clear.